Their use fosters a sense of unity and solidarity among the students of a given school. Uniforms help to promote an environment of equality among students. Use of uniforms eliminates difficulties in clothing selection for both students and parents. As a visible sign and outward representation of SS. Simon & Jude Cathedral School, uniforms should be clean, neat, and in order, reflecting a pride in appearance which is consistent with the ideals of the school. Uniforms may be purchased from Dennis Uniform Company anytime during the year. 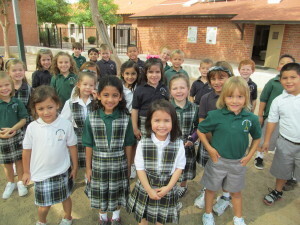 Used uniforms are available at the School Office year-round. Athletic or dress shoes with socks are required. Students must wear a black or brown leather belt. For more detailed Dress Code information, refer to the handout enclosed in this packet. Non-uniform (free dress) day requirements are strictly enforced – refer to the Parent/Student Handbook for details. *Administration and staff reserve the right to judge what is appropriate and acceptable.